Not that I wanted this. But it is how it is. Chicken and goats are continously on the mining site and drinking whatever water they find around. This gold pan had black sand particles with gold and mercury smaller than 200 mesh. It was sieves with the 200 mesh sieve. Such fine gold smaller than 200 mesh, including even smaller mercury particles are floating in the water. 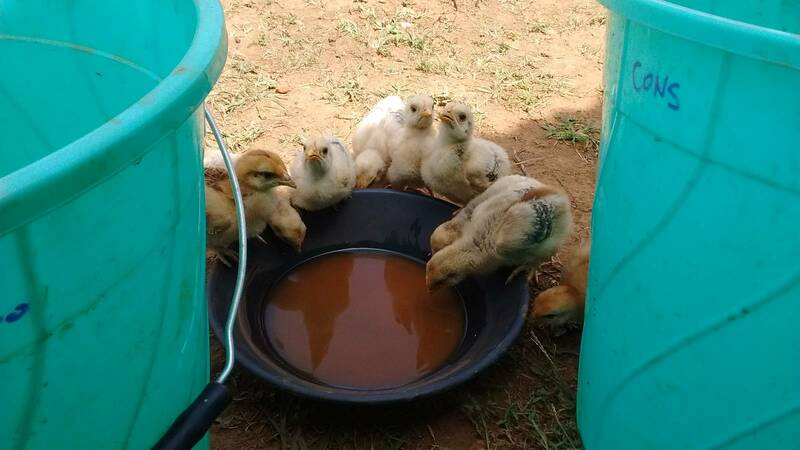 These chicks are drinking both the fine gold particles floating in the water and mercury particles as well. Mercury is a pollutant and poisonous, dangerous substance that we do not use in our mining operations. However, we collect mercury from previous processing, and such is then properly recovered by using retort and disposed as waste in secure storages. Small scale miners and artisanal miners are often using mercury in their operations. Simple tools are necessary to recover the gold, but education barriers prevent them to learn new methods.